PARK LIMITED MUZIK re-activates its release schedule for 2010 with a deep remix from HOT STATION’s "Moan". This is HOT STATION’s first single for the club market. HOT STATION came from fusion of TRANCENTRAL STATION and HOT*DOG. Their originals are based on funk music with soul, jazz, hip hop and house elements, but with pop market mentality. As a result, PARK LIMITED MUZIK brings a charged Mr. JONES remix for destined for the club scene. 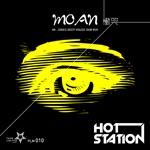 PARK LIMITED MUZIK re-activates its release schedule for 2010 with a deep remix from HOT STATION’s "Moan". This is HOT STATION’s first single for the club market. HOT STATION is yet another moniker of DJ 19 (aka AMBROZIA, VALID EVIDENCE, TRANCENTRAL STATION) and HIDE (aka HOT*DOG). The name came from fu-sion of TRANCENTRAL STATION and HOT*DOG. Their originals are based on funk music with soul, jazz, hip hop and house elements, but with pop market mentality. As a result, PARK LIMITED MUZIK brings a charged remix for destined for the club scene. Mr. JONES delivers a deep and techy remix. He’s a producer/DJ from the United Kingdom and has been producing and remixing house music under JP & JONES as well as THE DISCLOSURE PROJECT. Previous works include remixes for BLAZE, BURNSKI, CLOUDSTEPPERS, DANIEL KYO and many other well known producers. He has also had works released and licensed to labels like ACRYL, DEEPOLOGY, DEEPCLASS, EXQUISITE, PLASTIC CITY and many others. He also runs his own house label DISCLOSURE PROJECT RECORDINGS with fellow mu-sic partner JP PHILLIPPE.